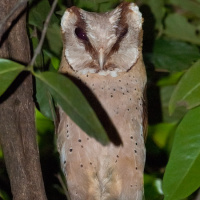 The Sri Lanka Bay Owl is a relatively small unusual looking owl with short rounded wings. 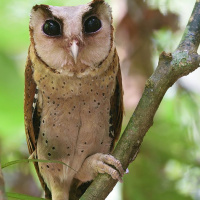 It is also known as the Ceylon Bay Owl. Typical call - Sringeri, Chikmagalur, Karnataka, India. October 2008. CC Ravi Prakash. Description: The facial disk is V-shaped and coloured vinaceous-pink, though this colouring does not reach the top of the crown. There are dark, vertical patches on the face that "go through" the brownish-black eyes. The bill is yellowish. 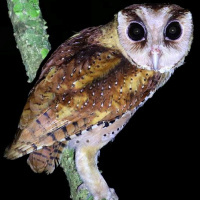 Upperparts are dark chestnut, densely speckled black and white, with a golden collar on the hindneck and golden patches on the scapulars. Wings are heavily barred dark, and the tail has 8-10 narrow dark bars. Underparts are pale buffish, with many black and white spots. The legs are relatively short and feathered buffish to the base of the bare toes, which are coloured pale greyish-brown with dirty whitish to pale grey claws. Size: Length around 29cm. Wing length 192-208mm. Tail length 81-90mm. No weight data available. 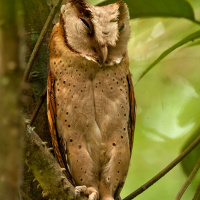 Habits: The Sri Lanka Bay Owl is a nocturnal bird. 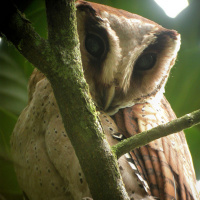 Although habits are not well studied, they are likely similar to the Oriental Bay Owl. Voice: A series of phrases of 3-4 whining, tremulous, whistled notes, first rising markedly, then falling. The duration of each note is 1-1.2 seconds, and they are spaced at one note per 2 seconds. The whole phrase is 4-6 seconds long. Hunting & Food: Poorly known. Pellets examined have contained only bones and fur of small rodents. Breeding: Little information available. Breeds in hollow trees. Clutch size is 2-3 pure white eggs. 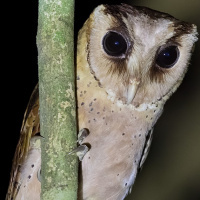 Young have been found in November in Sri Lanka that were very different in size, suggesting that incubation begins with the first egg, and successive eggs are laid several days apart. Habitat: Heavy evergreen and mixed forests, mangroves and cut-over forests from sea level up to 2200m elevation. 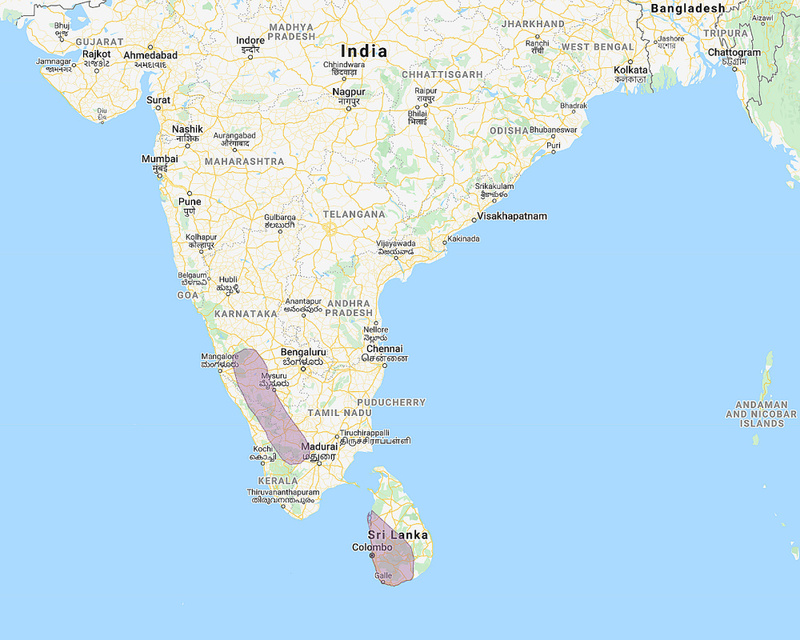 Distribution: Sri Lanka and Southern parts of the Western Ghats in the state of Kerala, India. Original Description: Hume. 1877. Stray Feathers, 5, p. 137-138. Page by Deane Lewis. Last updated 2016-03-02.